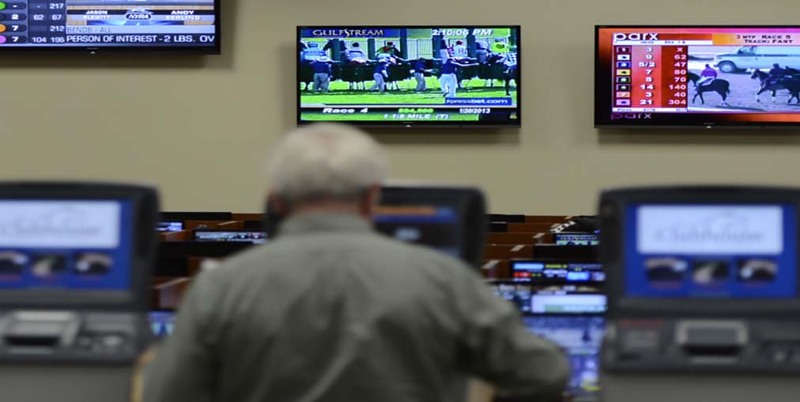 Horse-racing tracks in New Jersey could have legal internet gambling cafes available for patrons after a bill to allow casino-like gaming on-site was approved by the General Assembly. State legislators passed Bill A 4255 passed through the lower house with a 60-12-1 vote last week, authorising horse racing track owners to offer their own online betting and gambling services on-site. The idea behind the proposal is to allow patrons to use the internet gambling facilities in between races, in a bid to increase profit and attract more future visitors. The move would help the state’s struggling race tracks diversify their revenue streams and bring much needed traffic, according to Democratic Assemblyman Ralph Caputo, a former casino executive who is co-sponsoring the bill. Monmouth Park has already spent $1 million on its sports lounge in preparation for the potential win, and are ready to develop a casino and sports betting parlor in short order. Online gambling has been legal in New Jersey since November 2013, when Governor Chris Christie signed a bill to allow residents over the age of 21 to gamble online via computer and mobile devices – but only at casino sites located within and licensed by the state and run by Atlantic City’s pre-existing land-based casino businesses. As such, race track owners will need to reach out and form a partnership with an Atlantic City casino or their online affiliates to legally offer internet gambling services at their venue should the bill passes the state senate successfully. Opponents to the idea such as Assemblyman Vincent Mazzeo point out the bill would allow casino gaming outside of Atlantic City when the current constitution makes clear the famous resort city is the only place gambling is allowed in the state. “It specifically states in constitution of New Jersey that gaming is supposed to be done in Atlantic City and now they’re trying to expand it,” Mazzeo said. While proving divisive, other states which have legalised online gambling like Delaware currently operate state licensed iGaming casino sites in their race track venues. Three of Delaware’s race tracks – Dover Downs, Delaware Park, and Harrington Raceway – have internet gambling cafes which collectively made more than $3 million in net revenue in 2016. There are currently only four states which have legalised online gambling in North America – Delaware, Nevada, New Jersey and Pennsylvania, with the Garden State recording the most success out of them all. A report published by American advocacy group iDevelopment and Economic Association (iDEA) this year analysed financial data from 2013 to 2016 and revealed the state had raised $998.3 million in state revenue since legalising online gambling and creating its own regulated iGaming industry, along with many other significant economic benefits. New Jersey’s online gambling sector is projected to reach $250 million by the end of this year. Race track owners will have to wait and see if their bid is successful, as the bill moves to the New Jersey Senate, who have not yet scheduled a vote on the legislation.